Mine is probably the last generation to have positive experiences of beets. If you are younger than I am you may not have ever eaten one. Or worse yet, you may have had at traumatic childhood experience – say, at Great Aunt Eunice’s funeral – where you were forced to choke down a syrupy purple lump poured from a can by a short tempered, stern adult. I am begging you, I am pleading with you. I am urging you with all my Earth Motherish heart: give the wonderful, glorious, underappreciated, increasingly forgotten beet a(nother) chance. 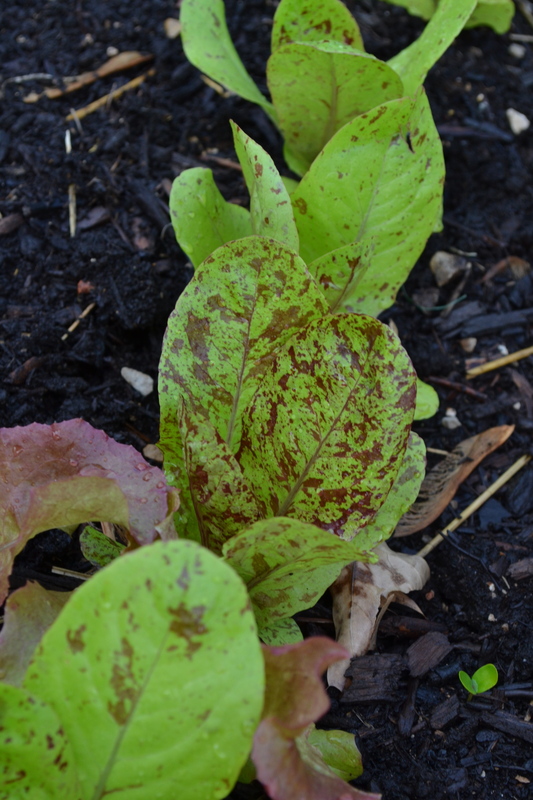 Forellenschluss is an heirloom variety of leaf lettuce with beautiful red speckles. It has a texture very similar to deer tongue, but without the slightest trace of bitterness. Usually, I make this dish early in the spring, after the asparagus is finished and after the turnip greens are too old for wilting. The brilliance of this dish is that the gardener can simply dash into the backyard, snip off whatever he or she wants, and toss it together. How is that for a grocery-shopping free meal? On the other hand, this dish is such a striking combination of colors, and a luscious juxtaposition of delicate textures, I am happy to serve it for company. I like to use the teeny lettuce and spinach plants I’ve thinned from rows to allow the remaining plants develop larger heads or leaf structures. 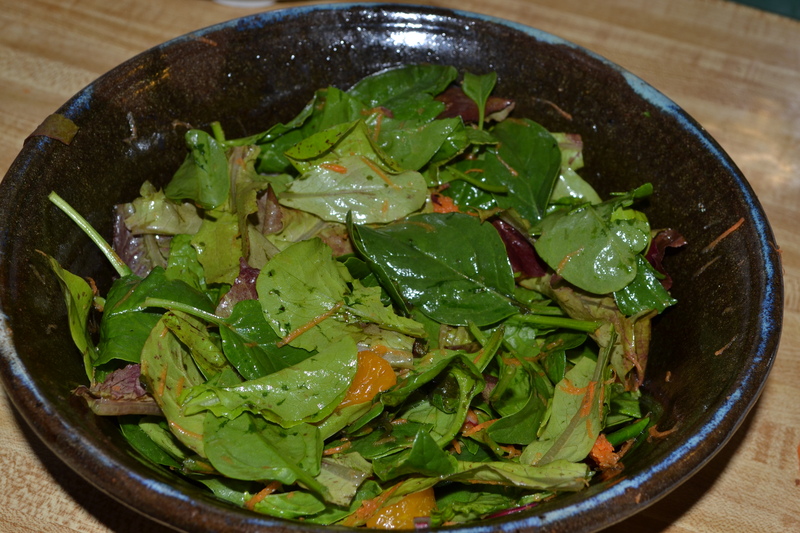 In this version of the dish, I have used Ruby Lechuga and Forellenschluss Leaf lettuces in addition to early spinach. You can use any tender, mild lettuce you enjoy. Try as many as you care to grow in your yard! Grow as many in your yard as you care to try in this dish! Go ahead! Mint is a gardener’s staple. I plant mine in deep shade to keep its aggressive tendencies under control. a good “fistful” of fresh mint leaves, as many as 5 – 6 stalks? This is probably the most labor intensive part of the recipe. Take your time with it. The quality of the vinaigrette matters. Prepare the vinaigrette before working with the other vegetables. You can even make it in the morning and let it “rest” for several hours before serving it with lunch or dinner. 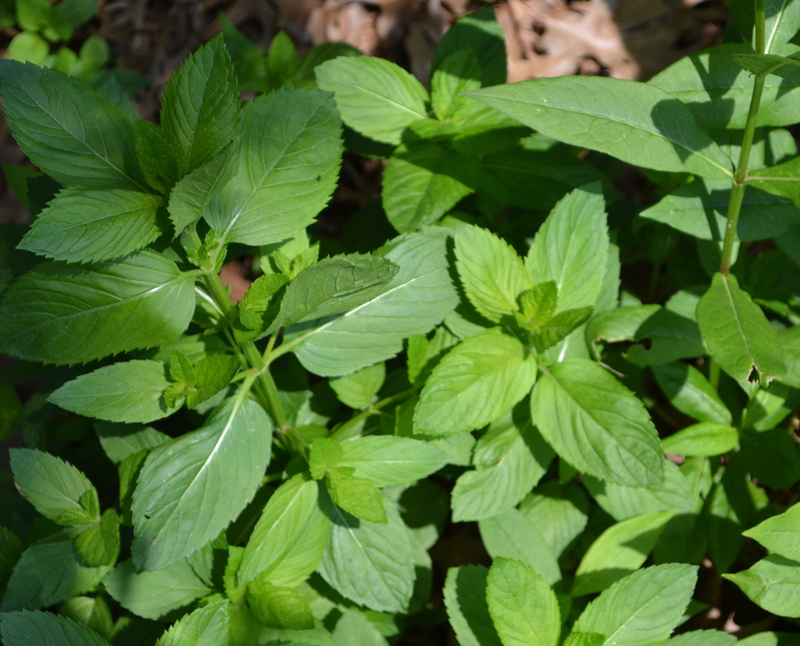 Strip the leaves from 5 or 6 stalks of garden mint, about enough to fill your closed fist. Discard the stalks, wash the leaves, and use a salad spinner to dry them. I strongly recommend using a mortar and pestle with this recipe. If you don’t have one, use the food processor method described below. 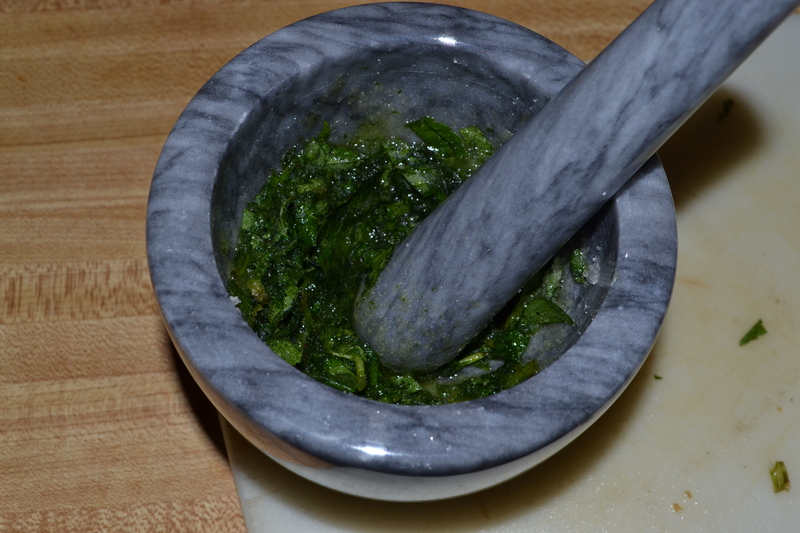 Chop the mint leaves coarsely so that they will fit into your mortar. Place 1 tablespoon of the granulated sugar in the bottom of the mortar. Layer ½ of the mint leaves on top of the sugar. Layer the second tablespoon of granulated sugar on top of the mint leaves. Add the remaining mint leaves. 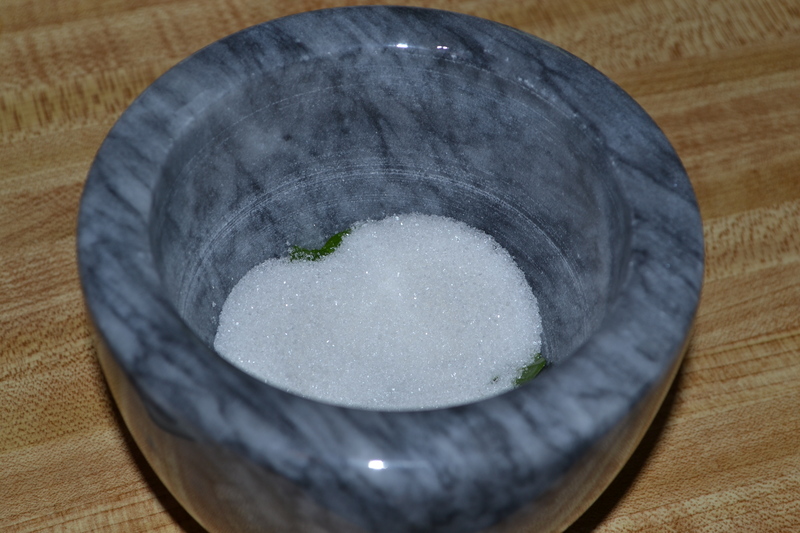 Use the pestle to crush the mint, firmly expressing the oil into the sugar crystals. Be aggressive. Be thorough. The finished product will look something like a smooth, green mint paste or spread. You shouldn’t see stems or recognizable bits of leaves. If you don’t have a mortar and pestle, you can get a similar result using a food processor, a stick or standing blender. Place the mint leaves in the blender, or in the food processor bowl. Add the 2 tablespoons of granulated sugar and process. Add 2 tablespoons of vinegar and process. Continue to add vinegar to the mix one tablespoon at a time until the result is a smooth, green mint slurry. Transfer the sugar-mint paste from the mortar into a bowl. Add 1/3 cup of vinegar and whisk hard, making sure all of the sugar is dissolved. If you processed your mint in a blender or food processor, simply add the remaining vinegar and puree. Taste-test the puree at this point. If you find that the solution is either too tart or two sweet, whisk in additional sugar or vinegar until you are satisfied. The mint flavor should be bright, clean, and not bitter. Transfer the mint-vinegar solution to a cruet. Add slightly less than 1/3 cup of olive oil, and then shake together vigorously. Allow dressing to “rest” at least an hour before serving. Wash the beets, and trim the green tops down to about 1”, but do not slice off the root top or tip. A beet isn’t like a potato so do not attempt to “peel” it. Place the beet(s) in a large sauce-pan, cover with water and bring to a rolling boil. Cover tightly with a lid, reduce the heat and simmer until the roots are tender, anywhere from 10 – 20 minutes depending upon the size. Pierce with a fork or skewer to test for doneness. Run the hot beets under cold water. When cool enough to handle safely, rub them firmly with your finger-tips until they “shed” their skins. This is always the best way to “peel” a cooked beet. Wash chilled greens. Dry in a salad spinner. These greens should be young enough that each leaf is already forking size. If you have leaves that are too large, tear or chop them lightly. Place in the final serving dish. Toss leaves with shredded carrot and julienned radishes. The colors should be evenly distributed for a good visual effect. Add mandarin oranges, reserving a small portion for garnish at the end. Add vinaigrette to salad, in the amount you prefer. Toss again, very lightly, enough for the oranges to interact with the dressing. Arrange diced beets centrally. Do NOT toss. 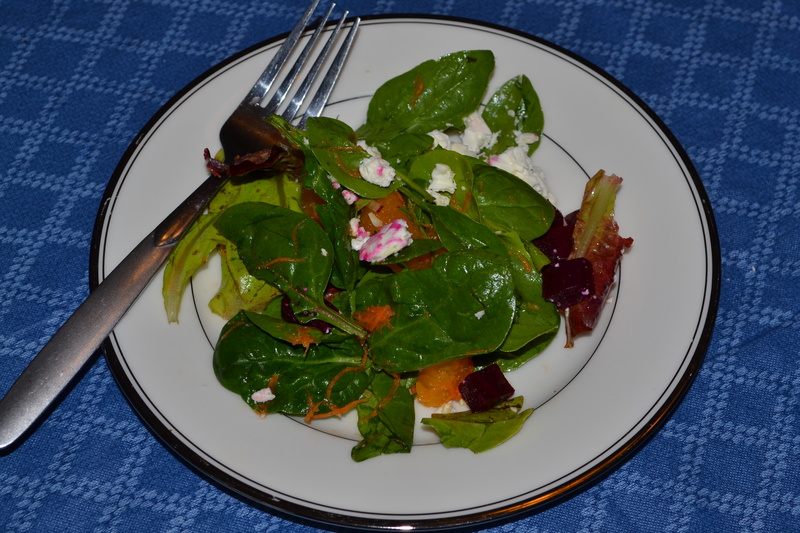 Arrange slivered goat cheese or crumbled feta over and around the beets. Garnish with last mandarin oranges. Top with slivered almonds. Crunch it with your teeth! Munch munch!! Colorful, cool, crisp, light. It tastes like spring. 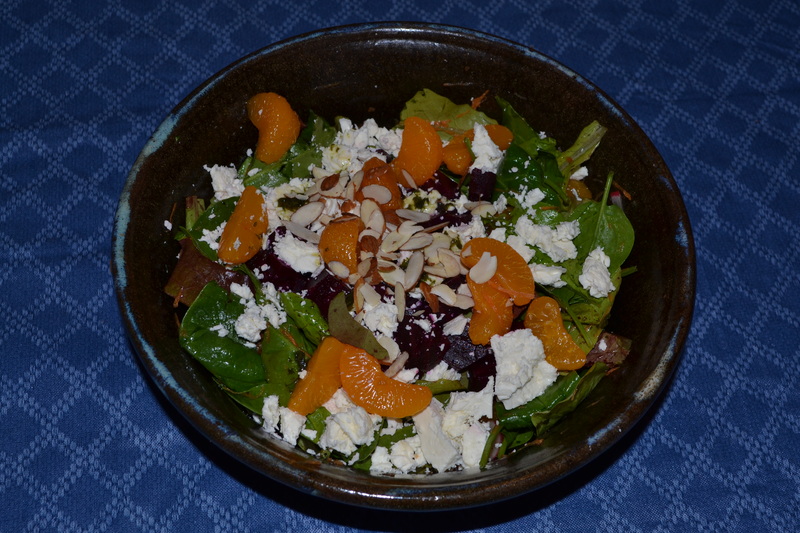 This entry was posted in Recipes and tagged Garden, Gardening, organic gardening, salad recipes, Vegetable, vegetable gardening. I never liked beets, or that is what I would say. The only beets I ever had were the pickled ones my dad made by putting canned beets into a jar that formerly held store bought pickles. They would sit in out basement refrigerator for an unknown period of time. But as a an adult I have tried beets cubed like this and they are wonderful! YUCK! It doesn’t sound to me as if you had been given any reason to like beets until you were an adult. This fall, when the beets are really sweet, after the first frost, try a bowl of borscht. That’s some good eating! Cheers!